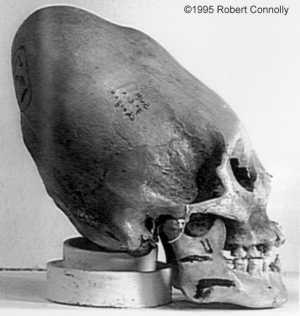 Cranial deformation is the practice of head molding and produces extreme elongated skulls. This practice existed in many cultures throughout the world and dates back as far as 45,000 BC as evidenced in Neanderthal skulls. Hippocrates is attributed with the earliest written record of cranial deformation in his description of the Macrocephaly or Long-heads (living beyond the Black Sea-Scythians) in 400 BC. Hippocrates also described the practice or “usage” of head binding. At first, usage was the principal cause of the length of their head, but now nature cooperates with usage. They think those the most noble who have the longest heads. It is thus with regard to the usage: immediately after the child is born, and while its head is still tender, they fashion it with their hands, and constrain it to assume a lengthened shape by applying bandages and other suitable contrivances whereby the spherical form of the head is destroyed, and it is made to increase in length. 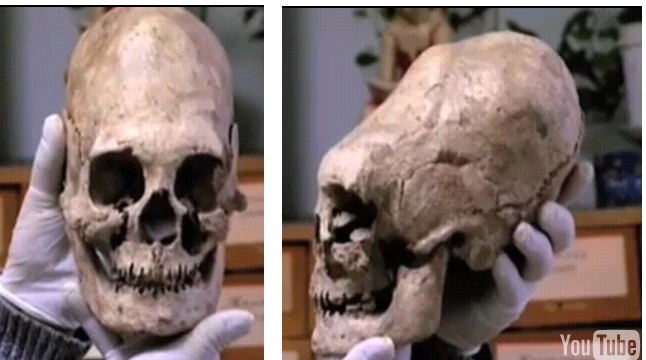 In the Old World, the Egyptians, East Germanic tribes, and Huns were known to have practiced cranial deformation. In the new World, the Maya, Inca, and North American native tribes also performed this custom. In some cases, cranial deformation was a sign that a child was destined for the priesthood, but with the Huns we encounter a mystery. Archaeology claims that the Huns bound the heads of some of their children and who retained the deformation as adults. However, no Greco-Roman source (Priscus being one) records seeing any evidence of this practice. The historian John Mann suggests that perhaps ‘the long-heads were an elite’.